The good news is that the current El Niño, a warm ocean current that drove temperatures up worldwide, is finally on its way out. But the bad news is that the unprecedented coral bleaching that El Niño triggered in 2014 shows little signs of slowing down. According to the October 3, 2016, update by the National Oceanic and Atmospheric Administration (NOAA), El Niño-Southern Oscillation (ENSO) is currently in a neutral phase and is likely to remain so during the winters. NOAA’s four-month coral bleaching outlook, however, says reefs in the eastern side of the Indian Ocean, the western side of the Pacific and the Caribbean are likely to sustain bleaching until January 2017. 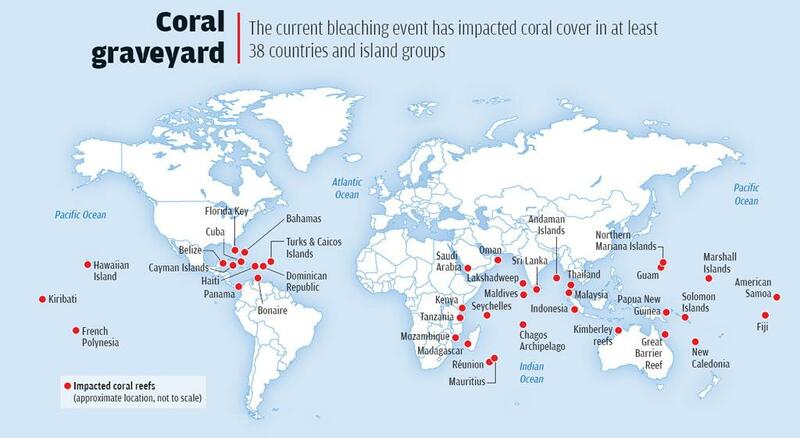 The current global coral bleaching event, which is the longest and most widespread event on record, began in mid-2014 from Hawaii and has so far left coral reefs in at least 38 countries and island groups ghost white (see ‘Coral graveyard’). From Australia’s Great Barrier Reef—the largest in the world—to the Lakshadweep islands in India, the current bleaching event has spared none. Scientists fear the world stands to permanently lose over 15,000 sq km of coral reefs because of the current bleaching event. Aerial surveys in April this year reveal that about 93 per cent of the Great Barrier Reef had suffered bleaching to some extent. 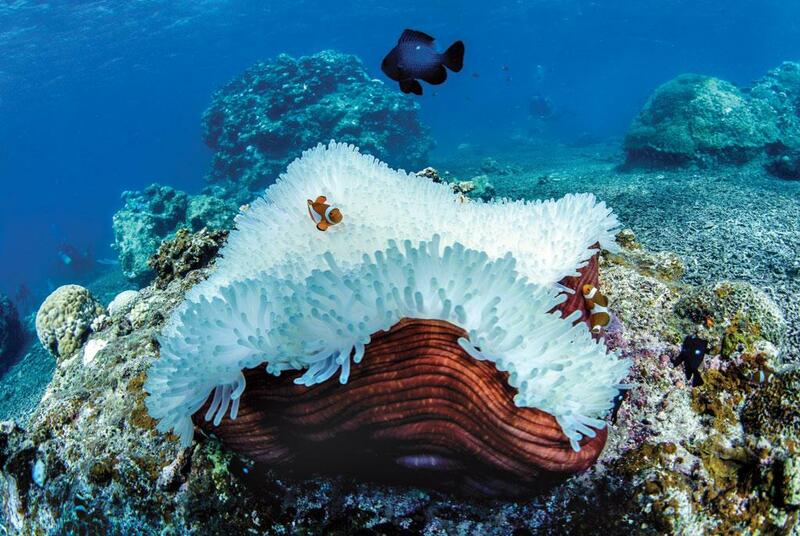 Of the 911 surveyed reefs, around a third are severely bleached. With as much as 50 per cent of the reef cover already estimated to have been lost, fears are that 50 per cent of what is left might be lost during the current event. The northern section of the 2,300-km Great Barrier Reef has been the worst hit in the current bleaching event, with 81 per cent of the 522 reefs surveyed indicating severe bleaching. “Though it has been predicted for many months, it’s not quite the same as seeing the devastation,” says Samantha Craven of UK-based Reef World Organisation. Despite covering just 0.2-0.25 per cent of the earth’s ocean area, coral reefs support up to 2 million species or a quarter of all marine life. For several island nations and tropical countries with long coastlines, corals provide protective services from severe tropical weather. Corals, like mangroves, cushion the impact of tropical storms that would otherwise damage infrastructure close to the coast. It is estimated that for the Central American nation of Belize, the economic value of the infrastructure protected by coral reefs is equal to 10-15 per cent of the nation’s Gross Domestic Product (GDP). Reef structures also act as indispensable genetic libraries and are often described as rainforests of the sea for their richness. Experts have, for quite a while now, believed that corals are among the most susceptible organisms to climate change. All three of the mass bleaching events ever witnessed have happened in the past 20 years—the first in 1997-98, the second in 2010 and the third is ongoing. In fact, the large-scale devastation caused by the current event, particularly in the Great Barrier Reef and the remote pacific atolls that had been relatively bleaching-free thus far, has triggered speculation of how far the world is from completely losing its coral cover. “In the first global bleaching in 1998, it was reported that the world lost 16 per cent of its corals. The current bleaching event appears to be the most severe and therefore has the potential to cause greater coral mortality than that seen in 1998,” says Tyrone Ridgway, professor at the University of Queensland. Considering that the world has already lost 30-40 per cent of its total documented coral cover, the current bleaching event is expected to have considerable ramifications. The World Wide Fund for Nature (WWF) calculates the total global asset of reefs at US$800 billion, with around 850 million people dependent on reef-based ecosystems for food security and livelihood. Close to 100 countries benefit from coastline protection, tourism and fisheries, supported by the biodiversity hosted by coral reefs. And a quarter of the 100 countries benefitting from coral reefs depend on tourism for more than 15 per cent of their GDP. According to a 2003 report made by WWF, the global annual benefit from coral reefs is close to $30 billion. It adds that fisheries and tourism sectors lose close to $5.7 billion and $9.6 billion a year respectively due to coral bleaching and death. The greatest economic threat from global coral degradation is likely to be felt in Southeast Asia, Australia and the islands of Oceania. Reefs in the tropical Indo-Pacific stretch are estimated to account for more than 60 per cent of the $30 billion contributed annually to the global economy by coral reefs. While it initially looked that coral reefs in India would escape the bleaching event, the story changed by April this year. 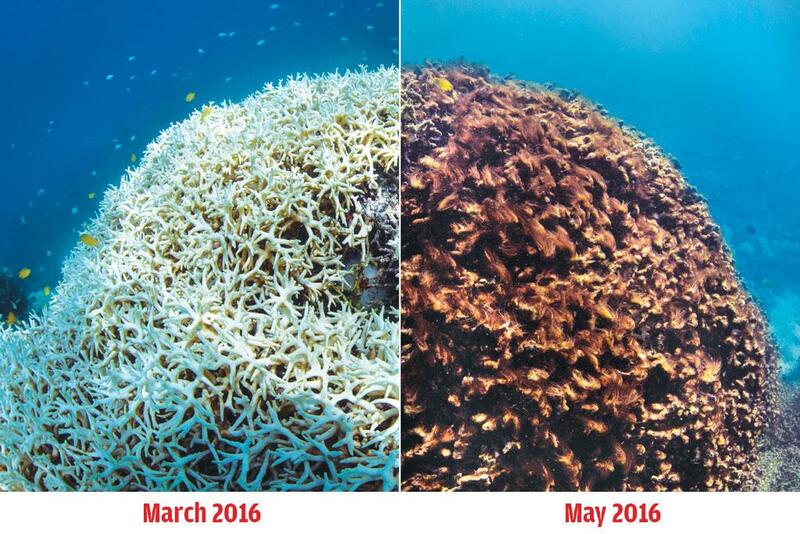 Expeditions by the Natural Conservation Fund (NCF) in Lakshadweep in April and May revealed a staggering scale of bleaching (see ‘Lakshadweep people may soon be the first climate change refugees in India’, p32). Shreya Yadav of NCF, a research organisation promoting the use of science for wildlife conservation in India, says, “Around 80 per cent of the reefs in the seven islands visited by us have experienced bleaching. Water temperatures remained very high, between 32 and 34 degree Celcius, which for me was unheard of in this region. It was quite devastating to see the extent of bleaching, but we don’t have the numbers yet since the reports are being analysed now.” The Gulf of Mannar too has exhibited 40-50 per cent bleaching, says P Krishnan, a researcher at the Union environment ministry’s National Centre for Sustainable Coastal Management. According to J K Patterson Edward, director of Tamil Nadu-based Suganthi Devadason Marine Research Institute, the percentage of reefs that experienced bleaching in the gulf is close to 60 per cent. “We have again had intense heating with sustained temperatures up to 33.6 oC so we expect 10-12 per cent of coral cover will be lost again this year. 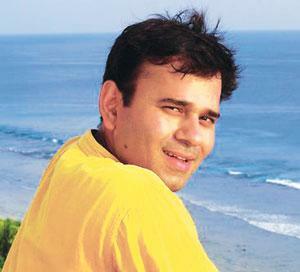 The cyclonic activity in May in south India brought respite but heating started early this year,” says Edward. So far, there has been good news from Andaman and Nicobar as the majority of the reefs surveyed have been spared large-scale devastation. The most cited reason for the stress on corals has been global warming and associated climate change. The world has already witnessed a 0.8 oC rise in average global temperature since the pre-industrial era and all forecasts predict further increase at the same or higher rate in the foreseeable future. More than 90 per cent of the accumulated anthropogenic heat ends up in the oceans. To give an idea of how much energy this is, the heat stored by the oceans in the past 30 years is roughly equivalent to the energy released by one nuclear bomb dropped into the ocean every second of the 30 years. This uptake of energy has been increasing in the past 40 years and according to most reliable climate models yet, the upward incline is set to continue for a few more decades at least. According to NOAA, sea surface temperatures (SSTS) have been higher in the past 30 years than at any other time since records were established in 1880 and around 70 per cent of the tropical and sub-tropical oceans, where most of the reefs are located, continue to show a strong decadal heating trend. Coral systems generally live in a symbiotic relationship with dinoflagellate algae called zooxanthellae. The coral skeleton provides the algae with a home and some nutrition while the photosynthetic algae, in exchange, provides the host with nutrition that enables reef-building and other critical activities. About 90 per cent of the coral’s energy requirement comes through this arrangement. Algae, living in the nooks and crannies of coral skeleton, are what give reefs the magnificent vibrant appearance (see ‘Red hot problem’). Corals are stressed easily by disturbances in temperature, light, radiation and water composition. Under thermal stress, even with an increase of just 1-2 oC, the symbiotic relationship, vital to the health of both the coral and the algae, breaks down and the algae are systematically expelled. The expulsion causes the coral reefs to lose their colours and attain a pale and deathly look. Bleaching, by itself, does not imply mortality. Small scale, short duration bleaching events have been reported from several locations over the past century and often these events are followed by a period of recovery when temperatures recede to normal levels. “If conditions return to normal quickly after the stress, the corals have the ability to recover. In doing so, the algae remaining in the coral tissue asexually reproduce and repopulate the coral tissue,” says Ridgway. Of late though, bleaching events have increasingly become a global affair with thermal stress conditions persist for several months and this is dangerous. NOAA imagery of the SSTS reveals a nearly uniform band along the equator that has experienced above normal temperatures in April and May this year. Bleaching leaves corals weak and without energy to continue with vital processes essential to their survival. So sustained bleaching drastically reduces the chances of recovery. Another problem is that dead reefs are often taken over by non-symbiotic algae, which are detrimental to the marine-life supported by the reefs. Reef Check Foundation, an international non- profit dedicated to conservation of two tropical coral reefs and California rocky reefs, has reported that dead coral reefs off Hong Kong are currently under a cover of red algae. Coral colonies, once dead, can still recover but take a longer time—ranging from a few years to decades. This depends on the local environmental factors as well as the type of corals. Carrie Man-frino, president of the Central Caribbean Marine Institute, cites coral recovery at Cayman Islands as an example. “(After the 1998 bleaching,) We conducted annual surveys and discovered that though the corals did not die immediately due to the thermal stress, a white plague disease set in and over a period of four years, we lost 40 per cent of the coral community. It was not until 2009, when all of the sudden, we began seeing a rapid regrowth across the entire reef system and among all of the different species of corals,” she says. Manfrino adds that while having an extensive marine protected area did not stop bleaching, it definitely contributed to the recovery. Even when bleached corals manage to recover, long-term survival is not guaranteed. The stress of bleaching leaves corals in a compromised position. Apart from increased susceptibility to any impending bleaching event, recovering corals suffer a reduced reproductive potential which adversely affects reef-building ability. 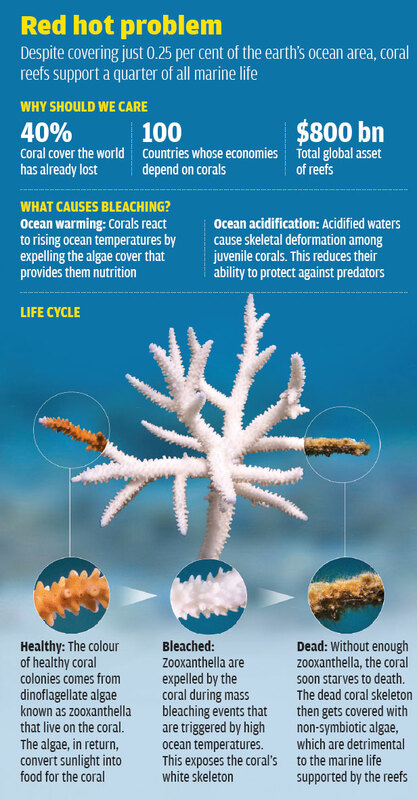 Moreover, bleached corals are also more vulnerable to diseases and coral-eating organisms. In fact, after the mass bleaching episode in the Caribbean in 2005, much of the death associated with the event was not a direct consequence of bleaching, but due to diseases. “Once the corals regain their colour and full complement of algae, it does not necessarily mean that they are fully healthy straight away,” says Ridgway. To say that warming alone is responsible for the massive coral cover losses in recent decades would be an oversimplification. Ocean acidification, another by-product of global warming, is equally responsible for the decay of coral reefs world over. Since the beginning of the industrial era, the concentration of anthropogenic greenhouse gases (GHG) in the atmosphere has skyrocketed. The ocean, being a massive carbon sink, has sequestered much of these emissions. While this has contributed in mitigating rising temperatures on the land, the impact on underwater has been less sobering. Carbon dioxide (CO2) reacts with water to form carbonic acid. Over time, the carbonic acid dissociates to form a bicarbonate ion and a proton, effectively reducing the carbonate concentration in the water. This reaction has turned the oceans more acidic, or less alkaline to be more precise. It is widely accepted now that anthropogenic GHG emissions have caused ocean pH to drop from natural levels of 8.2 to 8.1. While this change might seem miniscule, it represents a 30 per cent increase in acidity in the world’s oceans since the pH values are calculated on a logarithmic scale. The change in ocean acidity does not have any precedence for hundreds of thousands years and the impact on reef-based ecosystems are likely to be tremendous. Carbonates are vital for shell building organisms living under water, including corals. A drop in the concentration of carbonates in the water reduces organisms’ ability to produce calcium carbonate. Reef-based ecosystems survive due to a delicate balance between calcifying rates of corals and biological erosion arising from predation and natural disturbances. As much as 90 per cent of the calcium carbonate deposited by corals and other calcifiers are lost due to erosion. In such a scenario, a declining rate of calcification due to acidification threatens to disrupt the existing balance that is critical to maintaining reef-based ecosystems. A 2016 study by the University of Western Australia shows extensive skeletal deformation among juvenile corals in acidified waters, which reduces their ability to protect against predators. In late September, the concentration of CO2 in the atmosphere broke a climate barrier by registering stable levels above 400 parts per million (PPM), an increase of about 35 per cent compared to pre- industrial levels. The tipping point for corals is said to be when CO2 levels reach about 450 PPM. At this point carbonate concentration in water will no longer support coral growth. A 2008 paper published in the journal Geophysical Research Letters has shown that corals will actually start dissolving as CO2 levels reach double of what they are today. In an ever-warming world, most climate change studies predict massive coral losses. The World Resource Institute estimates that about 90 per cent of the coral species in the world will be in danger of bleaching and death by 2030. A study published in the Annual Reviews in July 2016 has claimed that warming and acidification together will make coral bleaching an annual event between 2030 and 2060. A 2015 study published in the journal Global Change Biology used historical data derived from the fossils of the Eocene era (period between 56 million years ago and 33.9 million years ago) when climatic conditions were comparable to current times and mapped the suitability for corals in the world’s oceans under climate simulation scenarios for the coming hundred years. The researchers found that overall suitability of the oceans to harbour corals would reduce considerably in the future, with the tropics, which house the maximum coral hotspots, affected the most. Scientists in Australia ran a similar simulation and found that corals would, on an average, grow 7 per cent faster under pre-industrial conditions. With climate models predicting global temperature rise of up to 4 oC by the end of the century, corals are an obvious candidate for extinction in the near future. But corals enjoy the advantage of diversity. In their hundreds of millions of years of existence, corals have survived five periods of mass extinction because of their diversity. The world is currently believed to have entered the sixth mass extinction and if corals stand any chance of surviving, it will be because of the variation in coral responses. 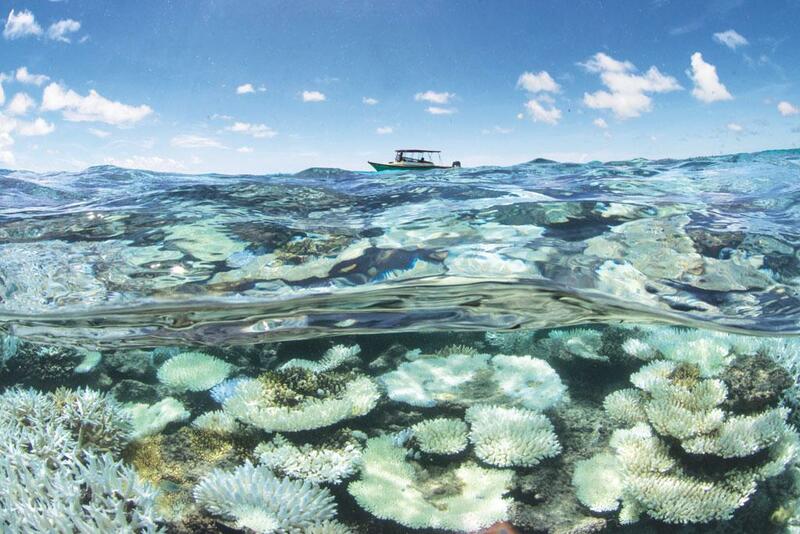 Researchers have identified traits that might aid corals to adapt to higher temperatures. Corals that store high quantities of fat within their structure and those with good growth rates have high chances of survival under thermal stress. Certain species in the Caribbean and the Indian Ocean have been found to swap algal partners with coral varieties that have higher thermal tolerance to cope with temperature increases. Corals, being simple creatures, also enjoy high rates of evolution. It has been observed that some species have the ability to acclimatise to warming conditions and then pass on the required responses to the next generation in a process called transgenerational acclimation. This generational learning increases the thermal stress threshold in the specific species. In the warm waters of the Middle East, where bleaching has almost become an annual affair, certain species of corals are able to survive and recover in waters at temperatures up to 4 oC above normal. A recent report by the United Nations Environment Programme has highlighted the role of deep water reefs (about which relatively much less is known) as potential refugia for coral and fish population. As temperatures climb, some species of shallow water coral might have to adapt by relocating to deeper colder waters. For example, coral species Millepora Intricata, found in the Gulf of Chiriqui in Panama, can live both in shallow and deep waters. Following the bleaching event of 1998 it was observed that while the shallow water M intricata had been wiped out, small colonies survived in deeper waters. Within four years after the bleaching event, colonies started reappearing in shallow waters. The success stories associated with some species in dealing with warming conditions have triggered suggestions that natural adaptation of corals may offer a way out of the current mess. “Macro climatic processes are very difficult to mitigate but nature has its own coping and immune mechanism, development of resilient species is going on,” Krishnan says. Several leading experts in the field, however, doubt the natural adaptation strategy. As climate change increases, global temperatures will get closer to coral thresholds, giving the corals less leeway before bleaching. For example, species of fast-growing corals that suffered severe bleaching in southeast Asia during 2004 recovered only to face another spell of mass bleaching in 2010. Scientists say the current bleaching event will leave the species under tremendous stress. So putting all eggs in the adaptation basket will probably lead to staggering losses in marine biodiversity, just as what likely happened under previous periods of mass extinction. As tipping points get closer, calls for human intervention to conserve corals have grown in volume. Translocation of resistant corals is one of the most common suggestions. But swapping of one coral species with another involves risks of disturbing natural balances and introducing pathogens novel to the region. “While relocation of resilient corals may work in the short term, they are somewhat of a band-aid solution. It also reduces the genetic diversity of the reef,” says Ridgway. Another suggestion has been the use of genetic manipulation to increase thermal thresholds of corals. However experts say that introducing genetic changes in corals is extremely expensive and time consuming. Gregor Hodgson of the Reef Check Foundation says targeting the algae that inhabit corals instead will be a lot cheaper. “Zooxanthellae reproduce quickly many times per day. So the key is to make zooxanthellae more resilient through natural and assisted evolution such as genetic engineering and then seed them on reefs,” he says. 3-D printing, too, offers new avenues for conservation and rebuilding although such possibilities are yet to be fully explored. In fact, most suggestions for human intervention are yet to be fully studied for probable consequences and suitability. “The scientific community is trying to understand the mechanisms within corals that lead to resilience, but things are still experimental,” says Manfrino. The cost of such interventions is another inhibiting factor. “These assistance schemes are expensive and can usually only be applied on small scales. For example, the Great Barrier Reef is about the size of Italy, so any schemes to restore it using resilient corals will largely be cost prohibitive,” says Ridgway. Incidentally, while global warming and acidification are cited as leading threats to coral populations, regional/local contributors are often underestimated in their contribution to coral reef devastation. It is estimated that over 40 per cent of total reef devastation has been directly caused by local pollution from urban areas, while around 10 per cent loss is attributed to climate change. Islands devoid of human activity still have almost pristine corals despite global warming and acidification. Discharge of sewage, industrial waste and fertilisers (which cause nitrification), over-fishing, dredging and irresponsible tourism have all been associated with adverse impact on marine biodiversity. The most sensible way forward would actually be to regulate discharges and economic activity better. “Without putting controls on human impacts on corals on a local scale, none of this (international pacts for climate change action) really matters. Humans are the biggest issue for corals. We mine them, blast them, step on them, dump sewage on them,” says Manfrino. The international consensus to limit global warming to under 2 oC offers a ray of hope for coral survival. But unless immediate action is taken to regulate local pollution in coastal regions with coral presence, ambitious global agreements on climate change will be immaterial to the fate of coral reefs. 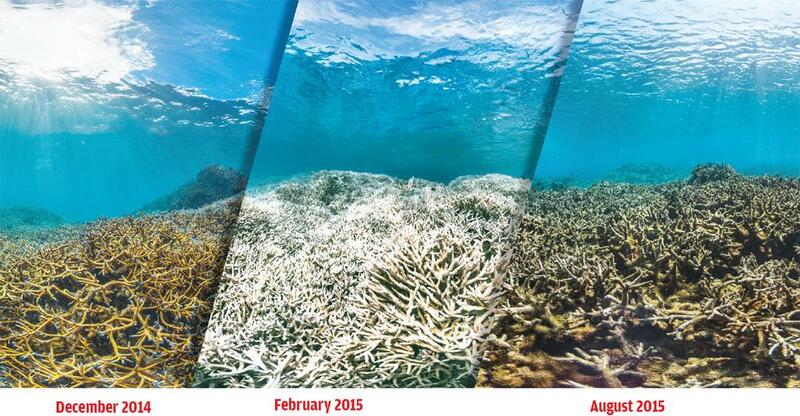 It IS already abundantly clear that 2016 will be a banner year for tropical coral reefs - the year the reef died, yet again! The last time this happened was in 1998. Then, the world lost over 15 per cent of its reefs in a single year to a monster El Nio. Although it will be several years before we can fully measure exactly how much we will lose this time around, by all indications, the El Nio of 2016 rivals that of 1998 in its intensity and impact. 1998 took us by surprise. Yet it brought to the forefront the fragility of our ecosystems to climate change. In Lakshadweep, within a few weeks we saw reefs decline to less than 80 per cent of their original coral cover. Fish numbers plummeted in reefs across the world. If 1998 served as a rally-cry to the scientific community, we scientists did, in retrospect, a rather bad job of making it heard to the world at large. The media too soon moved to the next headline, leaving the shattered reefs to limp to a patchy recovery. 2016 is different. Across the globe, marine biologists are now better prepared to document the disaster that is rapidly unfolding. In Lakshadweep, our researchers have been preparing for this for more than a year. Now, we are racing against time to measure the impact as it happens. We will have to wait until December 2016 before we can properly assess the impact. The long-term consequences will unravel over the next few years and decades. Our team already has a decent sense of what allows some reefs to recover after these disturbances while others succumb. In Lakshadweep, this is linked, among other things, to maintaining a healthy population of reef fish, particularly herbivores that mow the macroalgae down and keep the reef substrate clean for arriving coral recruits. Predatory fish ensure that coral-destroying animals do not increase in number. Unfortunately, since 2010, there has been a growing commercialisation of reef fish. It is now clear that the reef cannot sustain even low levels of commercial fishing. Knowing how critical reef fish are to reef recovery, my fears are that these reefs will not bounce back the way they did after 1998. This story was first published in the October 16-31, 2016 issue of Down To Earth magazine.